Bubinga is an exotic hardwood from equatorial Africa with an exceptional strength to weight ratio. It’s rich and luxurious grain bears a close resemblance to rosewood and along with other high-end instrument makers we like it for it’s hardness and figure. Being slightly denser than the birch laminate I think it has a pleasing ‘gravitas’ when struck although in reality there is little difference between the playing surfaces. As with any solid wood key care must be taken to avoid sudden temperature and humidity changes. Don’t leave next to radiators and cover if left in an auditorium overnight. Like most piano keyboards the Xylosynth is velocity sensitive – the harder you hit the louder the sound – with the full MIDI range from 0 to 127. There are two knobs situated top right hand. These analogue (variable quantity) controls on the Xylosynth are very simple. 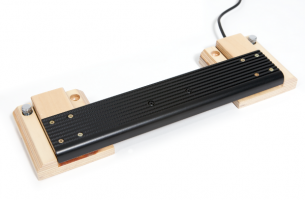 One is for setting length of note from 0.03 to 8 seconds but can be overidden at any time using the sustain . The other is for setting sensitivity depending on certain factors such as your playing style or circumstance (all is explained in the manual). 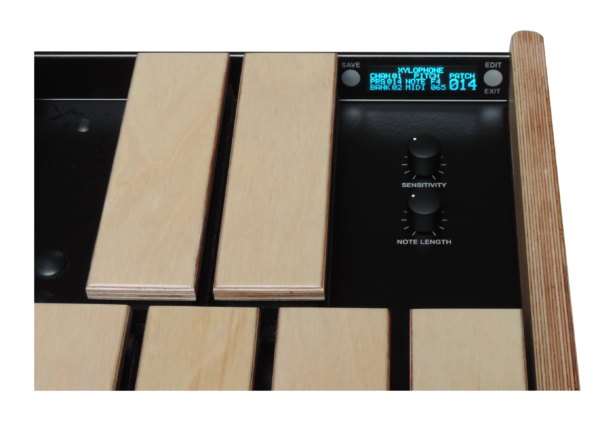 The new Mk7 Xylosynth is USB powered. There are two USB slots. The top slot is for power only. The bottom slot can be used for power and communication (to access external sounds via USB). For a 5 Octave instrument, or if you only have USB 2 on your laptop, you can use the bottom slot for communication but will have to get power from elsewhere using the top slot. There is the usual 5 pin din MIDI connector for accessing external sounds from a sound module or other MIDI device. You can choose to have our onboard sounds which come with headphone socket and a line-out to amplification. They are of average quality but inexpensive and a good way to start. This does not stop you accessing external sounds at any time using the ‘MIDI out’ or USB connections and cables provided. 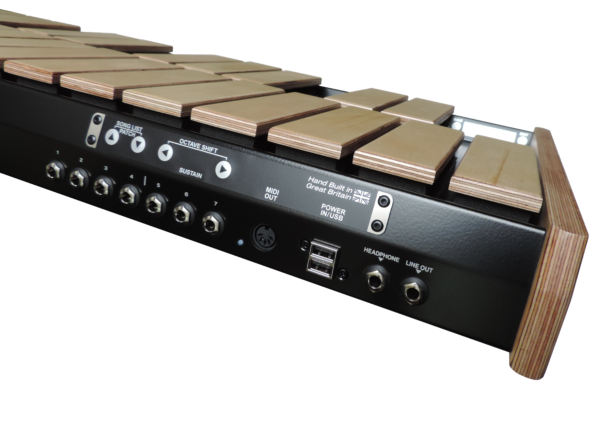 The new Mk7 Xylosynth has push button and jack socket controls. The Mk7 Standard has 5 jack sockets for digital (on/off type) functions such as changing patches, octaves and sustain. The Mk7s Special has 7 jack sockets, 4 of which are analogue (variable quantity) so if you wish, you can use them with expression pedals or drum triggers! The jack sockets are programmable so you can set them up to suit yourself. The new Mk7 OLED display shows exactly what’s being played at all times, giving you confidence when performing. It’s where you can set the programmable functions of your Xylosynth. For more detailed information go to FAQ’s on the Home page and look under ‘Where can I find manuals for my Xylosynth’.